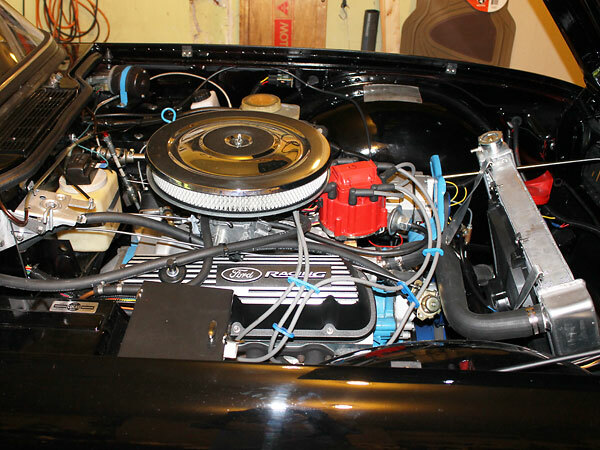 Engine: rebuilt Ford 302 V8. 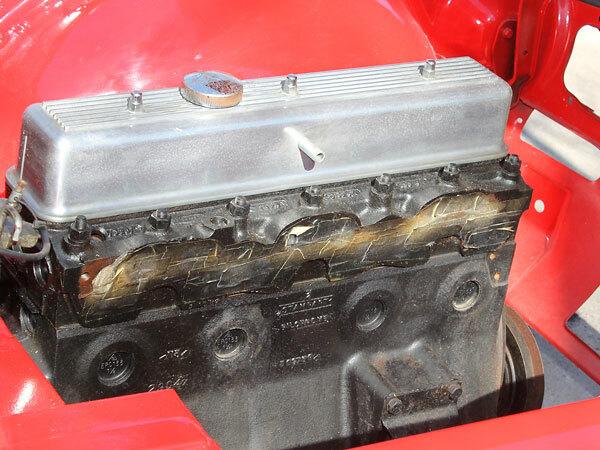 Edelbrock E-Street aluminum cylinder heads. Edelbrock camshaft. Roller lifters. Edelbrock Performer 289 low-rise intake manifold. Edelbrock 500cfm carburetor. HEI distributer. AC Delco 8mm silicone spark plug wires. 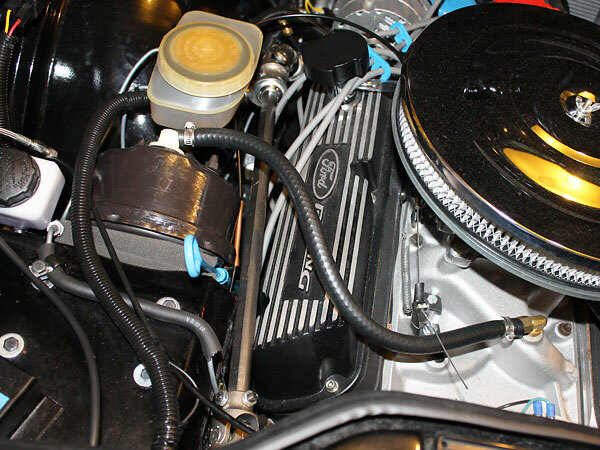 Ford Racing valve covers. Cooling: 19" by 24", 3-row, cross-flow, aluminium radiator. 16" Kenlowe electric fan. Exhaust: Speedway block hugger headers. Stebro twin-pipe exhaust. Transmission: T5 5-speed. 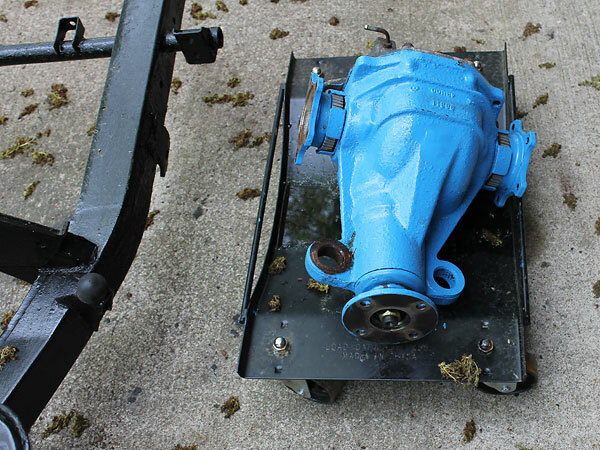 Tilton hydraulic throw-out bearing. Rear End: Good Parts Nissan / Infiniti Q45 limited slip differential. 3.7:1 gear ratio. CV jointed axles. 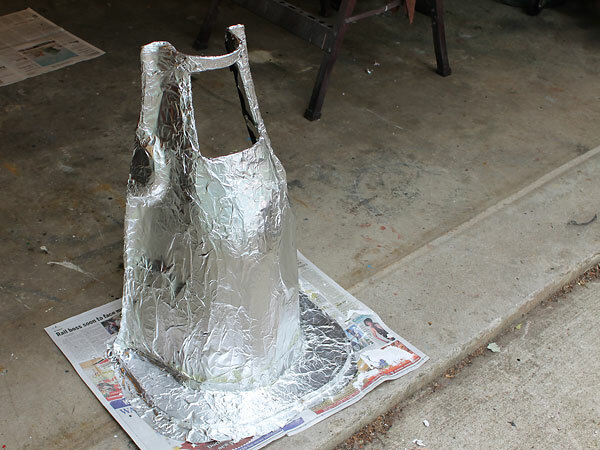 Frame: totally rewelded, with many diagonal braces added. 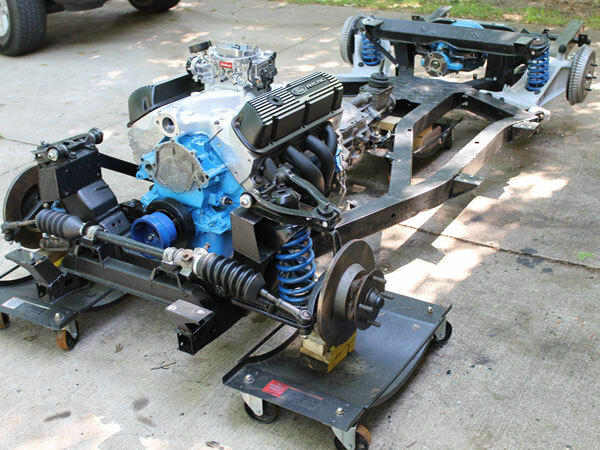 Fabricated motor mounts to locate the engine lower and further back than many other conversions. 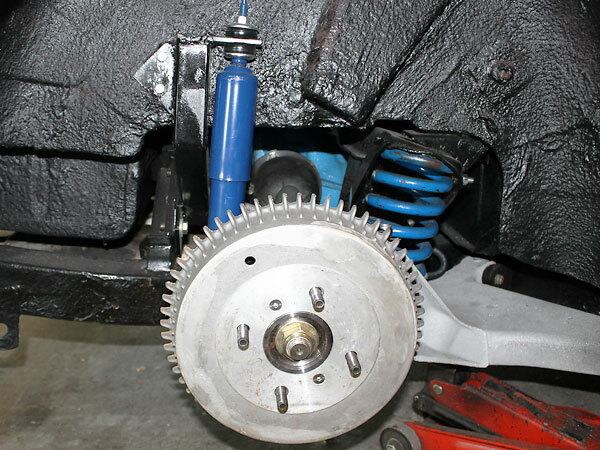 Front Suspension: 300 lbs./inch springs. 7/8" ADDCO sway bar. Four Borgeson steering U-joints to get around engine. 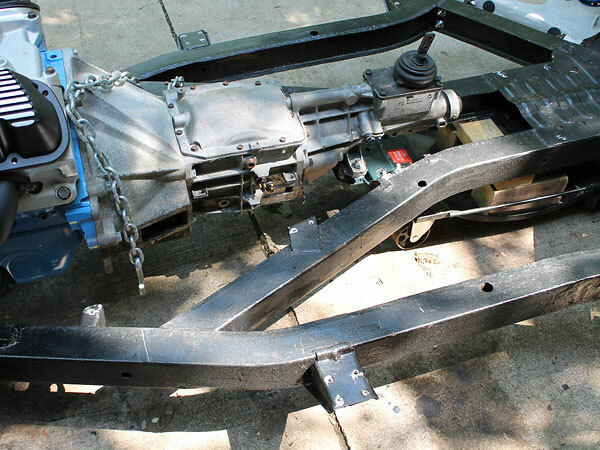 Rear Suspension: 375 lbs./inch springs. Telescopic shock absorbers on fabricated brackets. 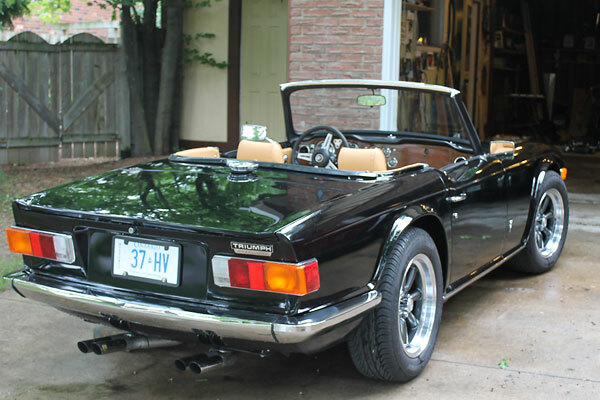 Brakes: (master) stock Triumph TR-6 cylinder and booster. (front) Wilwood 4-pot calipers and solid rotors. Wheels/Tires: Konig Rewind aluminum wheels (16"x7", with zero offset). General Altimax RT tires (215x16). Interior: biscuit colored vinyl interior. Electrical: battery relocated to the trunk. Fuel pump relocated to the trunk. Completed: this project took about 11 months to complete. 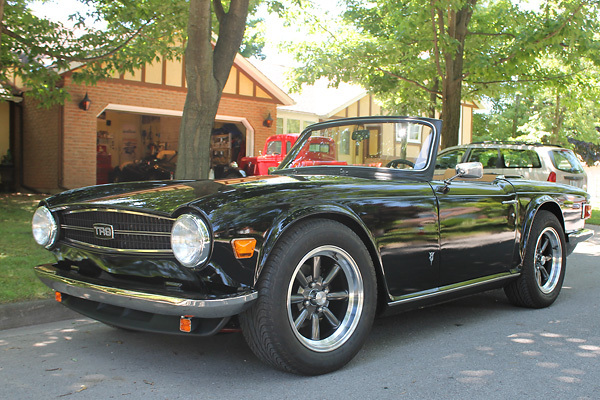 Comments: I hope my pictures are a helpful to others contemplating a Ford V8 for their TR-6. 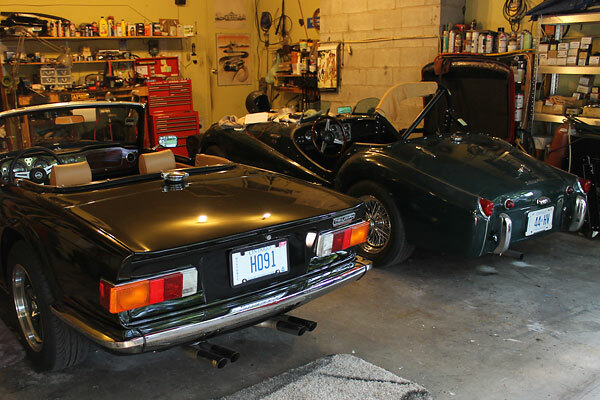 I pored over "British V8 Magazine" many times during this project. 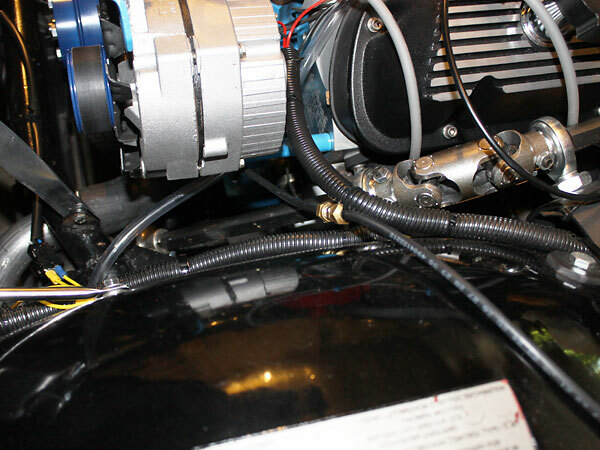 Edelbrock E-Street aluminum heads with HEI distributor and Speedway block-hugger headers. 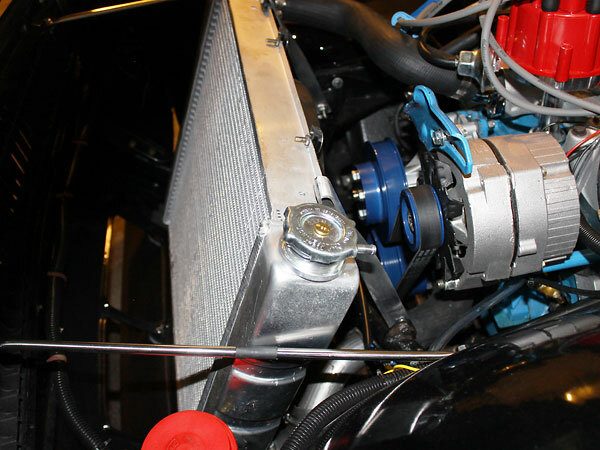 An Edelbrock Performer low rise intake manifold leaves one inch of clearance above the air cleaner. 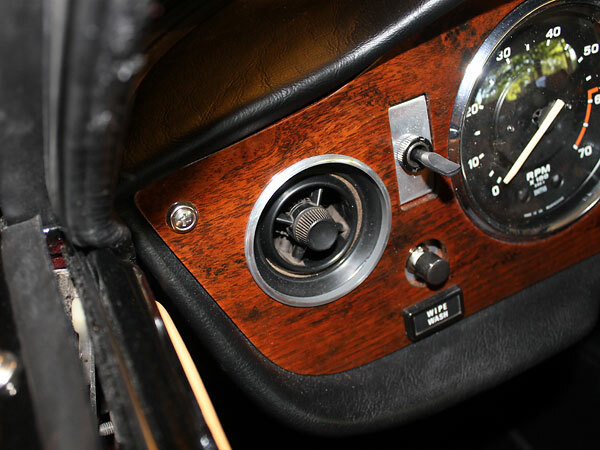 Four Borgeson U-joints route the steering around the engine. Even with this arrangement, steering feel is very light. 19" by 24", 3-row, cross-flow, aluminium radiator with 16" Kenlowe electric fan. studs. ADDCO 7/8" sway bar mounted on a 4" by 1/4" plate bolted to the bumper supports. 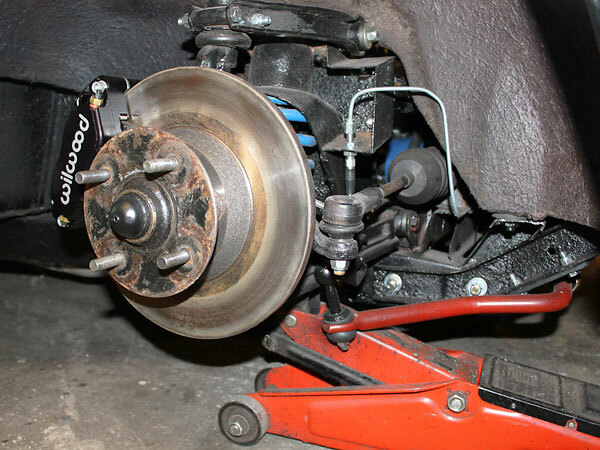 "Alfin" (aluminum finned) brake drums are mounted on Good Parts hubs with 3/8" studs. 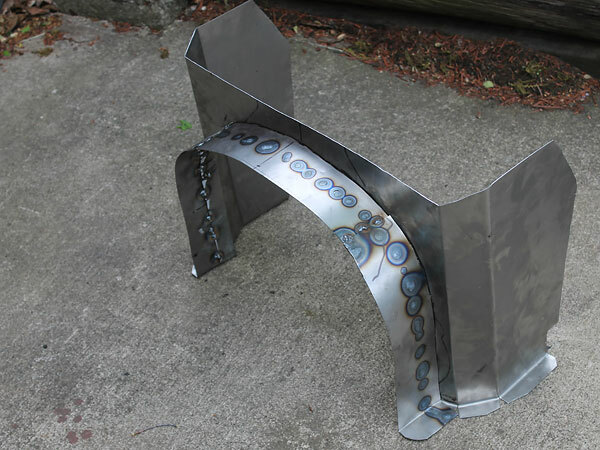 Custom fabricated steel 1-1/2" by 1-1/2" tube shock mounts. 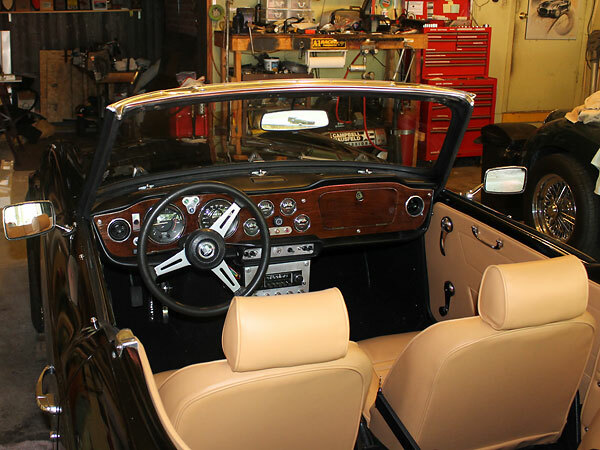 "The dashboard has been ground down and refinished with my own graining and lots of Varathane. 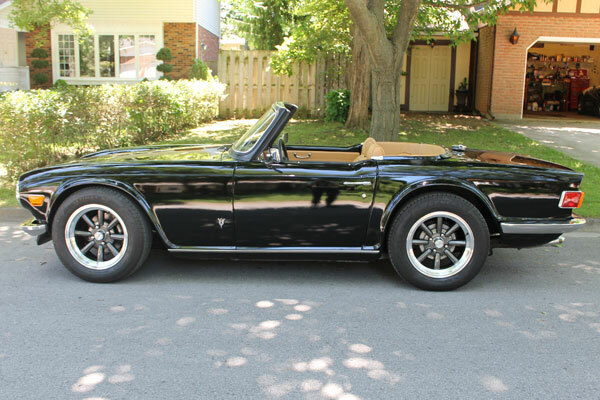 Assembled with TR-6 gages with domed glass crystals and chrome bezels from a Triumph TR-3. the mechanism for an electronic unit from Auto Meter. (This was a simple change over.)" Custom turned/polished stepped aluminum rings fit dashboard cooling vent openings. 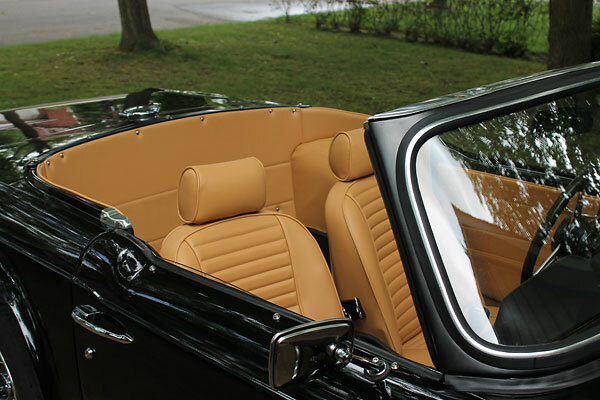 A leatherette covered aluminum box accommodates the 6" rearward placement of the T5 transmission. 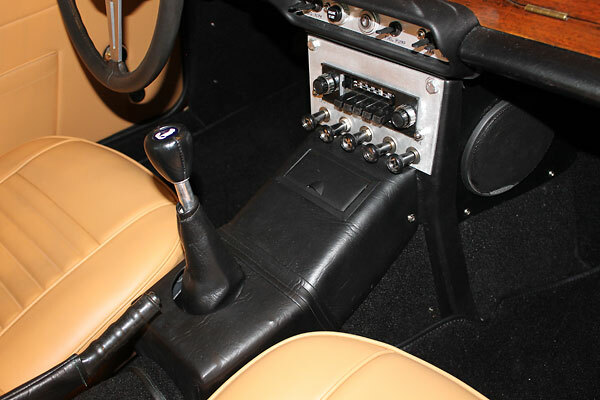 than the newly installed Ford 302 V8 (with aluminum heads and 5-speed gearbox). 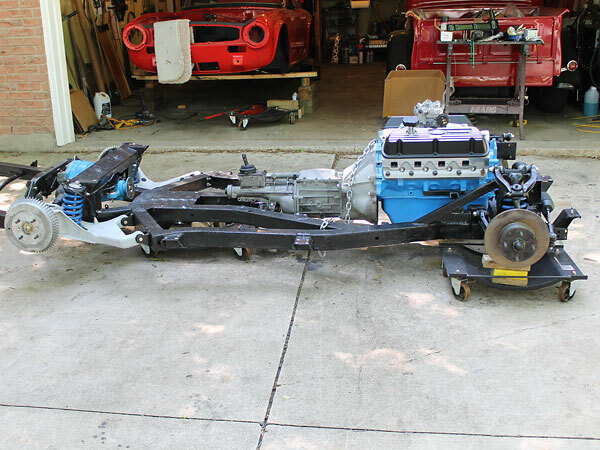 Engine and transmission has been fitted to the Triumph frame. 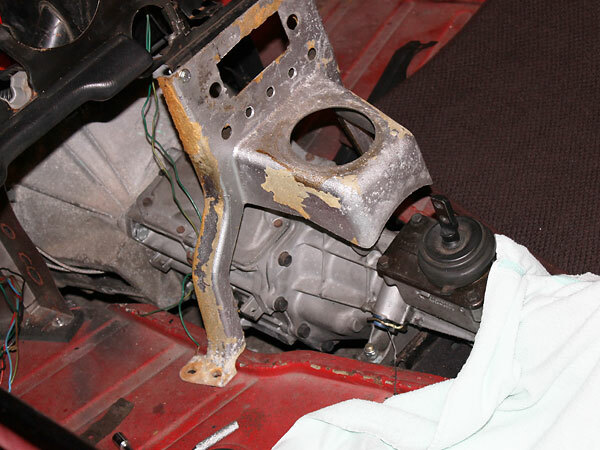 This photo shows how far rearward the engine has been placed. Nissan / Infiniti Q45 differential. Original battery tray and transmission tunnel of the stock TR-6. 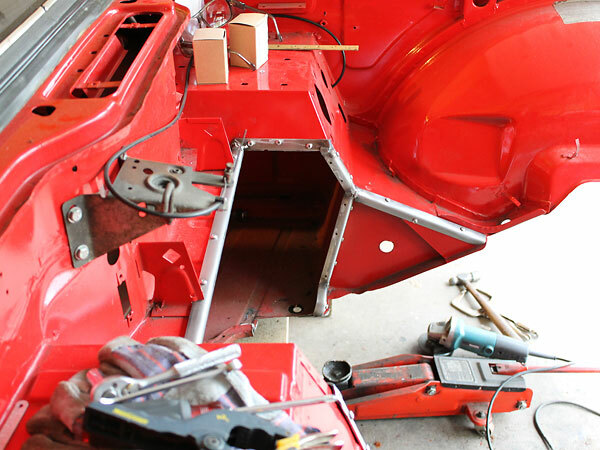 After cutting and framing the Triumph for the large transmission tunnel. A side shot of the new transmission tunnel. Newly welded 16 gage steel transmission tunnel. 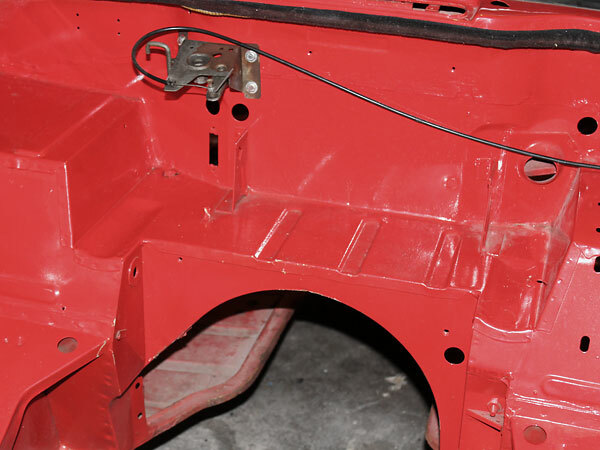 New bumpers were installed lower and closer to the body for improved appearance. 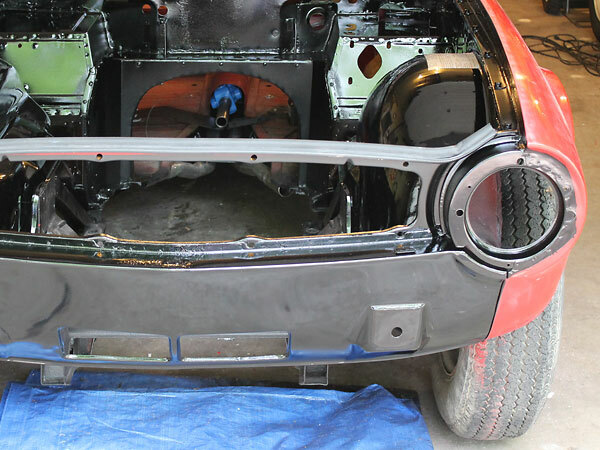 To facilitate bumper relocation, parking light holes were filled in. 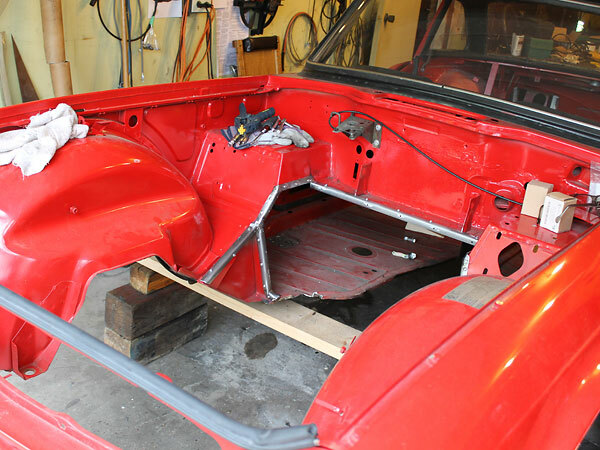 The original Triumph TR-6 transmission cover was made out of cardboard. 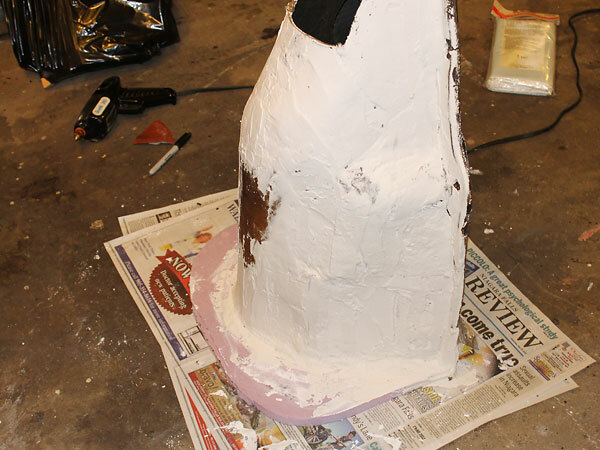 a mold over which a larger (though lightweight) fiberglass tunnel could be made. 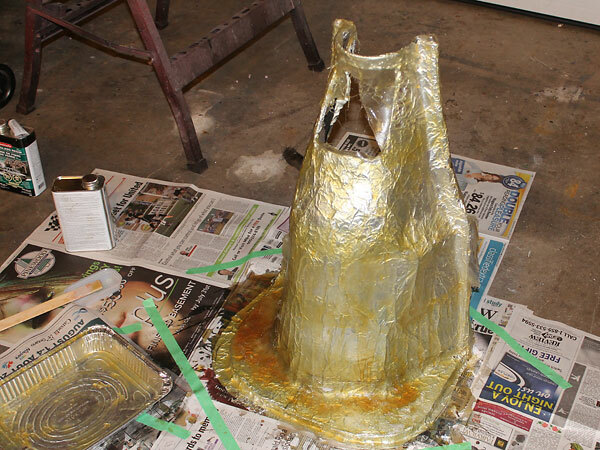 Derek sprayed adhesive over the built-up cover and then applied a layer of aluminum foil. 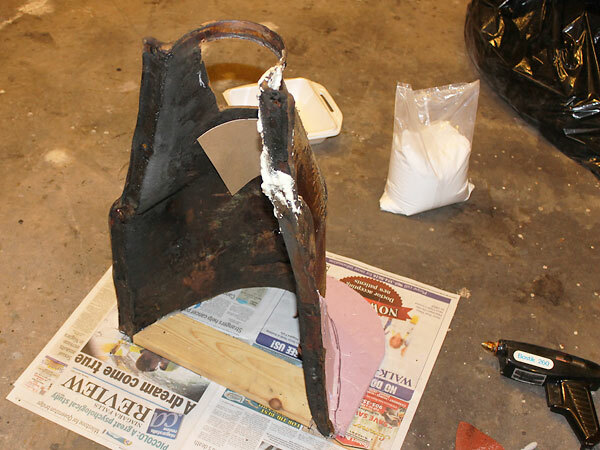 the new molded fiberglass transmission tunnel was pulled away from the foil. lower and also rearward six inches to suit the new T5 5-speed. Konig Rewind aluminum wheels (16" x 7" with zero offset). General Altimax RT tires (215x16"). DuPont Centari acrylic enamal in "Pitch Black" (color code 99A).